In Los Angeles, one residential treatment center is taking its client job placement program further by providing professional internships and jobs. Creative Matters is a full service creative agency staffed almost exclusively by those in recovery from addiction who are either undergoing or have completed treatment at Beit T’Shuvah, a faith-based residential addictions treatment center. Founded in 1987 as a transitional home for released inmates, Beit T’Shuvah soon began to focus its efforts for those in recovery on preparing and finding employment. Then in 2009 John Sullivan, an addict in recovery, Chief Operating Officer Rabbi Mark Borovitz and Advertising Executive Russell Kern founded Creative Matters. Intended to be an in-house graphic design team, Creative Matters grew into a full creative agency, staffed by the recovering addicts of Beit T’Shuvah. Katz spent many years working in digital marketing before she decided to move into the nonprofit sector after witnessing a close friend’s struggle with addiction. She found Beit T’Shuvah on Google and a couple of days after submitting a résumé she joined the team. – Take the Gallup Strengthfinder 2.0 test to discover your top five natural strengths and ways to optimize them in your life at strengths.gallup.com. – Read “The 7 Habits of Highly Effective People: Powerful Lessons in Personal Change” (Simon & Schuster, 2013) by Stephen Covey. First published in 1990, the book is a business bestseller on the balance of personal and professional effectiveness, and ways to perform better in both arenas. In mandatory twice-weekly meetings staff members and interns are encouraged to share about their lives and recovery. Since the interns are often still in treatment, supervisors at Creative Matters work closely with treatment teams at Beit T’Shuvah in order to know and understand an individual’s progress in recovery. Creative Matters profits return to the treatment program at Beit T’Shuvah. In this way, clients not only help those in recovery gain job skills and experience but also support addiction treatment for others. Kendl Ferencz is currently the art director at Creative Matters, but she started with the agency in a much different place. In 2009, she was the first graphic design intern while in treatment for addiction to heroin and opiates. When she was 14, Kendl’s friend’s father had knee surgery. His doctor prescribed oxycodone for the pain and the two friends decided to take some too. “I figured out that I was addicted pretty quickly after that,” Ferencz said. By 16, she was also addicted to heroin and believed the drugs were helping her. “I had always been an extremely anxious kid, and getting loaded made it easier for me to talk to people and to be more comfortable with myself,” Ferencz said. It wasn’t long before she began to steal from her parents to fund her growing drug habit, which was actually pushing her into isolation. When she earned a scholarship to attend art school in Philadelphia, she enrolled in a methadone clinic. For the next few years, Ferencz was in and out of treatment until one night in a cheap motel room she had had enough. She checked back into the last clinic that she had relapsed from, Beit T’Shuvah. “I think I was desperate enough this time to not want to go back to how I felt my last relapse, that I was willing to take direction from people instead of doing it my way,” she said. The biggest struggle was to speak honestly with her peers and mentors instead of pretending that everything was okay. She credits her recovery to the second chance at a fulfilling career through Creative Matters. As the art director, she now mentors other people in recovery at Creative Matters. 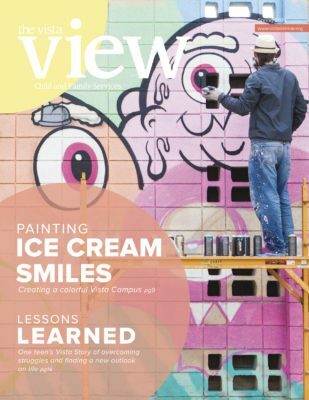 Recent cover of The Vista View produced by Creative Matters for Vista Del Mar, a child and family services nonprofit in Los Angeles. 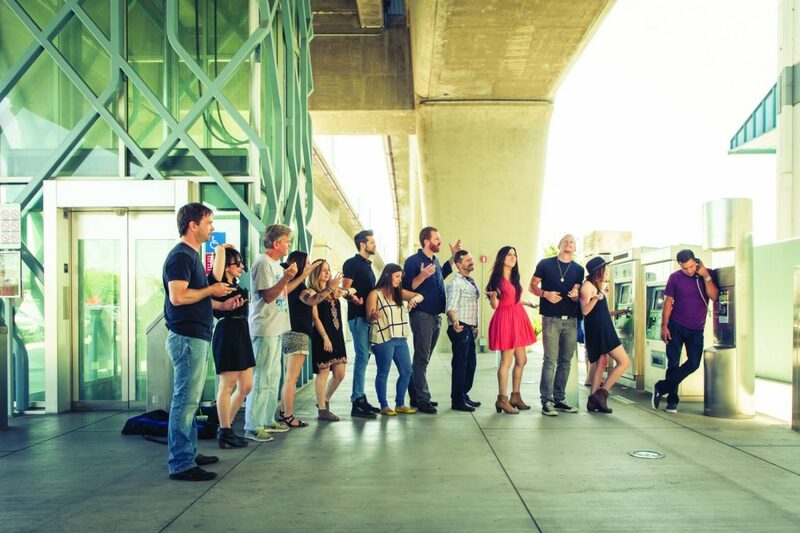 The agency is proof that professional job training has power. For people like Ferencz, opportunities like this can be the difference between a recovered life and a lost one. Previous ArticleCan a job save the world?